Yes. Value Added Tax is VAT. When you put the word “refund” after VAT, means that there is a returned money or value. Many tourist know how to deal with VAT refund procedure but if you don’t I can tell you how to get it. When you are traveling to Europe, Asia or North America or any country that you’re not their citizen, you can claim VAT refund. Each store in different countries has its own policy about VAT refund. For example, H&M in Paris only allows VAT refund when you purchase items at minimum of 175 Euros of your total receipt. You can shop 3 different times in H&M but the total amount of 175 Euros has to be on the same day. Combine all receipts and they will work on the TAX form. What if you go to Paris and fall in love with a Louis Vuitton bags? Very simple. 1. Shop the bag and pay for it. I recommend using a credit card, Visa, Master and Amex. 2. The price on the bag is what you’re paying for. Let’s say their Mini Pochette is 204 Euros. You will be charged for 204 Euros. 3. When you are paying for this item, LV staff will kindly ask you if you would like to claim for TAX or VAT refund (same thing). You will say Yes please. Then get your passport out. 4. LV staff will fill out the form for you according to your passport. Name and Passport number are recorded on to your Tax form at this point. 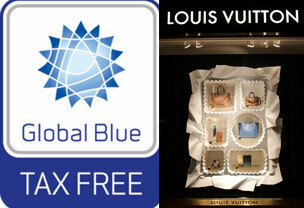 LV is affiliated with Global Blue, the company who will handle your money return. 5. LV staff will hand you the Tax form. It is blue fonts on a white paper. You will fill out your name and address, etc. They will ask you if you want your refund money in Cash or back to you credit card. If you choose to have it back to you card, then show them which card it is. 6. Once everything is done. LV staff will hand you the receipt (LV receipt) and the tax claim form. You will walk out of the store with 2 very important pieces of documents, if you lose one of them, then you can’t really claim your tax. Unless you lost your LV receipt and they can reprint it for you. Do not lose your Tax claim form though. 7. When you are leaving Europe, it doesn’t matter what country it is, Italy, Germany or Spain. Make sure you have that very important papers in your hand. Keep your item that you bought in Paris in your hand. 8. At the airport, go to Customs office first! Do not check in your bag unless you only buy one item and it will go in to your carry on bag. 9. At the Customs, they will ask to see your receipt, your Tax claim form. They will ask you to show the item that you purchased. Show them what they want to see. If you bought 10 items, it will be a random pick. I had to show one item out of 6 items. 10. The Customs will then stamp your Tax Claim paper (that has Global Blue on it). If you don’t have this stamp, you can’t claim tax. 11. Then you will grab everything, your receipt, your Tax form, your purchased item, to Global Blue counter. 12. Hand the stamped Tax form to the staff at the Global blue and keep your LV receipt. Global Blue has a receipt for your record, do not lose this one either. Right here, they will ask for your credit card that you want your money refunded to . 13. The staff will put all required paper works into an envelope and put it in the mail for you!! I was very surprised when she said “I’ll mail everything out”. It was great, short and simple. I did not have to mail a thing! 14. At this point, you can put all purchased items into your checked-in luggage. I carried mine. I don’t want an unexpected delayed/lost luggage at the destination. 15. Wait for your money back 4-6 weeks. I got mine back within 4 weeks. How Much will I get my money back? It depends on where you bought your item. In this sample, I got my mini pochette in Paris. After I got my tax refunded, it came down to 10%. So, I paid 10% less on items that are already cheaper than the US prices. If you decide to have it in cash refund, you will either get 10% or 12%, it doesn’t have a rigid number. I asked Global Blue on the day of departure Europe, they said “it’s not necessary that cash percentage is lower than credit card’s”. I had my refund back to my credit card. It is 10% and it is not bad. I saved over $840 of the total price. The form on your left is what you will get inside the stores. You will fill out your name, phone number and mailing address. The very bottom piece is for you to keep. There is an estimate value of what you will receive for your VAT refund. Keep this piece with you for your record. In case of missing claims or you have not gotten your money back, you will have to show proves of purchase. Global Blue is a very well known company and is affiliated with many commercial stores. You will get a quick service at the airport if you have your documents ready, your items that your claim tax on ready, and your passport. When you stay in line at the Global Blue, make sure that you have these ready on hand. Get your credit cards that you want your money refunded to ready, Global Blue will have to get the card number in order to get your money transfer to it. When I reached the window at the Global Blue, the staff first notified me that LV charges $1 (or a Euro, can’t remember) for this tax claim fee. I said “OK” without asking her to repeat it. Everything that costs $1 or a Euro is fine by me. The price comparison in this table is based on $1.37 = 1 Euro. If you take a look at my price sheet above, you’ll see how much cheaper a pochette already is in Paris, before the VAT refund. I think it is worth the trip to get what you want and it is worth the extra time to fill out the form for your money back. Where is VAT refund office at the airport? You will have to find it yourself. Search the airport website, there usually is a sitemap and it will tell you where it is. The easiest way is to ask any staff at the airport where the Customs is and the the customs’ staff will tell you where Global Blue is. I’m not affiliated with Global Blue, I use this as my sample because I bought my mini Pochette at LV and they affiliated with Global Blue. This picture below is what the Global Blue office usually looks like, only it is more crowded with a long line. Spare an extra hour at the airport if your flight is a prime time flight like lunch time or dinner time etc. The earlier you get there, the better chance you will get everything figured out way before your check-in time. 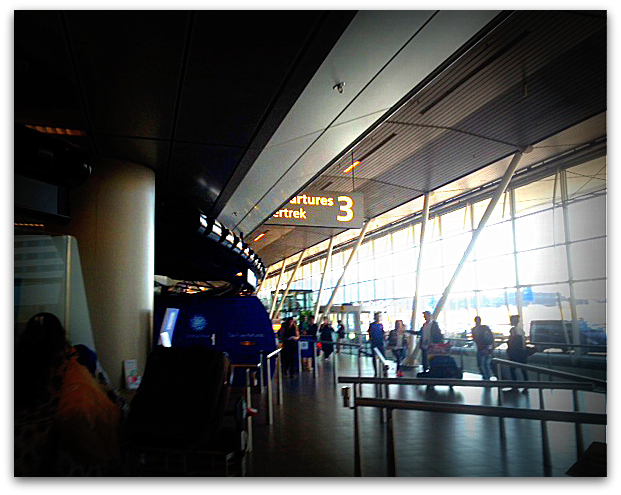 I departed Europe through Amsterdam Schipol Airport. When you arrive at the airport, facing the departure terminal, you’ll look for Departure 3. It is almost at the end of the terminal building. You’ll see the customs Tax free office then immediately to your right is Global Blue. 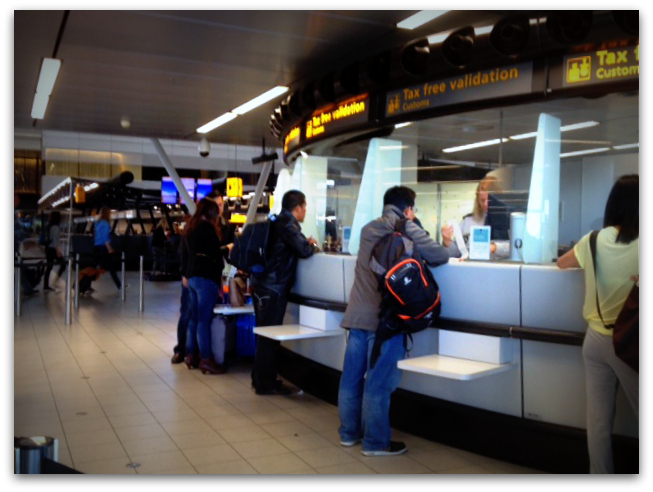 If you walk pass this customs tax free, you’ll see check in counters. But I don’t think you can miss the Customs Tax free. It is in your face and the line gives away the obvious. If you buy items affiliated with Premier TaxFree, you will have to take an elevator downstairs. It is very easy to find this Premier TaxFree as well. Fragrance, Makeup, Skin care products, Clothing, leather goods and many more. You cannot claim your hotel charge and meal. If you have an extra room in your check-in luggage and you won’t come back to Europe in two years, then go ahead and buy them because they are cheaper and worth the running around. Europe has more to offer than just shopping, I hope you find you what you’re looking for in stores and also have time to enjoy yourself checking out European museums and history. Good to know: Chanel is not affiliated with Global Blue but the procedure is pretty much the same. I only bought one item from Chanel and the refund time takes longer than Global Blue. If you have any question please leave comments below. I’ll be glad to help you out. Hi.. Thanks for the tax refund information, it’s very helpful for first time visitor to Europe. Can I know if there is an LV or Chanel Store in Schipol Airport.? Hi Jenny, thank you for visiting my website. There is no Chanel or LV store in Schipol Airport. The only airport that has both stores is Encheon airport, Korea. Not sure if any where else has them either. The airport ride to the closest LV store is not too bad. Public transportation is very on time and fast. Maybe you can check that out? Hope this helps. Have fun in Europe!! Hi thx for the tax refund information. im planning to buy a chanel bag in paris.. Lets say i bought it in lafayette, can i get a refund tax of the chanel bags in cash in lafayette? Or do i have to do itn in departure airport? And how abaout the receipt, do they keep it or return it to us. Thx beforee..
You can buy Chanel bags anywhere in Europe, but you will have to claim the tax refund at the very last departure airport. This means that if Paris is not your last country, then you will carry that bag to the last country you visit and go to that country custom counter. Let’s say that you are leaving from Paris. Lafayette or Paris or Canne, when you leave to come back to your home country, you will keep your receipt, but give the tax form from Chanel to the tax refund counter. Tell Chanel assistant that you want cash back even though you paid for the item with a credit card. Chanel will ask you if you want cash or back to your credit card? I recommend getting cash back. Fast, easy, and you will get pretty much the same percentage of tax refund. Please don’t confused your item receipt with the tax refund form. These are two different piece of papers. You will keep your Chanel receipt, but you will give the tax refund form to the company that Chanel deals business with. If you want your money back to the credit card, I recommend taking a photo of your tax refund form at the counter. Or you can photo copy that form, do this when you want to get the money back to your credit card. But if you want cash back, then don’t worry about it, you’ll get the money at the counter and then done. Hope this helps. Thank you for reading. Is there a limit in purchasing Chanel handbag in Paris? Also the cash refund option for VAT, does it mean we get the refund back on the spot in the store? Thanks for your comment. You can buy as many bags as you like (or at least that’s what Chanel told me). You will get the refund at the counter at the airport only. Chanel do not refund your money themselves. 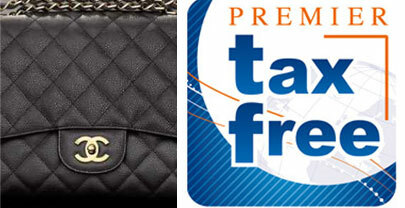 Chanel affiliates with Premier Taxfree company. Look for this counter at the airport after you’re done with the custom! Good luck! Thank you so much!! I was told by others that Chanel limits on handbag purchases so I just want to make sure! Can you expand on what is the difference b/t credit and cash purchase on VAT if there is a difference? Also I have read online that when asked if we want the receipt to show USD conversion the store charges a conversion fee do you know if that’s true? Thanks again!! Credit refund means that you will get the tax refund back to your card of your choice. Cash refund means that you’ll get the tax refund in cash form at the company counter. The percentage of credit and cash are not too far apart. Mine was 10% on both, credit and cash. It is just the form of money that you choose to get back to you. I have never heard of currency covert on receipts before. Neither LV nor Chanel asked me to convert anything on the receipt. So I’m not sure if it’s accurate. Either way, when you receive your money refund, you’ll get it in the form of your country currency if you refund with Credit. When you choose to refund it in a cash form, you’ll get it in Euro. You’ll have to exchange it back to USD and pay for exchange fee regardless. Is there a limit to how much you can buy at the LV store in Paris? I went a couple of years ago and there was but someone told me there isn’t anymore. Can you clarifying? Thank you! Hi Ms. Emsy. I don’t remember LV would limit the amount of bags or how much you want to spend at a time. I’m not sure if this applies to everyone for every passport holder. Have fun shopping. Hi Yvonne. You can claim tax at London Customs and if London is your exit airport to go home, London should be the only place to claim tax. Heathrow is very busy hub please allow couple hours for customs lines. I don’t believe there is Chanel or LV store inside Heathrow airport. The only airport I know that has both is Incheon, Korea. Have fun shopping!! Thank you for all this information. Quick question so say if a purse is listed at 1000 euros, is there a tax on top of that? Then you take off the VAT? Thank you for visiting my blog! Great question, I shouldn’t assume that everyone knows how sales tax works in Europe. Many countries in Europe and Asia show their price tax with sales tax included. So you’re paying what you see on the sticker! If it says 1000 Euros, you are paying 1000 Euros. Then you will get 10-12% tax refund off of that 1000 at the Customs. So your bag is already cheaper in Europe even if it’s in Euros. Plus you’ll get the VAT refund. I hope this helps? Have fun shopping! Hi, Thanks for the info that you share! I am leaving to London, Paris & Italy on next month November. It’s my first Europe trip. About the VAT refund, I know that I can purchase from London & Paris, then get the VAT refund from Milan airport before I depart back to my country. But I am a bit confuse about the process, when I go to the Milan Airport, first thing I need to go to Custom office to get it stamp & check. Second thing, I have to go to Global blue counter to get my money return (I prefer cash). 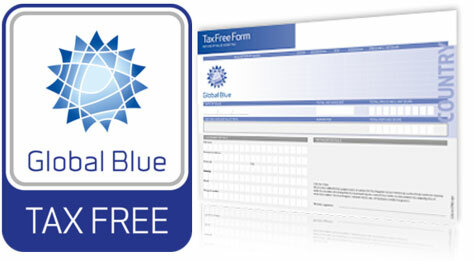 1) Other then Global Blue, different tax free company (premier tax free etc) have all their counter in the airport? Mean after Custom officer check & stamp, I have to go to different counter to claim back my tax? 3) Global Blue/ premier tax counter are located after immigration check? Heathrow airport now has both chanel and LV at terminal 5 right after security. There is aso a Chanel at terminal 3 at Heathrow. I was there about a week ago and located both stores. You can call the stores and ask if the products are available. However, you have to be flying out at either terminal 3 or 5 to go to their stores. It not, a personal shopping service can be arranged 24 hours before your flight online with a guarantee of $250 pounds purchase then they will let you go through the terminal. Hope this is helpful. Thank you Tran for the updates. I’m glad there are more! I was just in Narita, Japan and saw Chanel and Hermes!! Did not spend a dime due to delay flights but girls! time to save up some and shop those expensive bags! Hi, I asked my friend to buy a Chanel bag worth euro3300, but due to train delay he had no time to queue at the airport for tax refund. Is there still a way to get the tax refund now that he is back ? Dolly, I have not tried getting the VAT refund when I’m not present at the customs. My guess is very hard to get it back or no way to get it at all. Just imagine how many people a day in line for this refund at the airport. Maybe you can contact the airport that your friend last departed ? I understand that I’ll be getting the VAT refund as I am going through customs. Just to confirm, if I am flying from Germany, layover in the UK and destination is Canada, I’ll be getting my VAT in Germany? Hi Mandy, if your home country is Canada, then yes, you should get the VAT done in Germany. 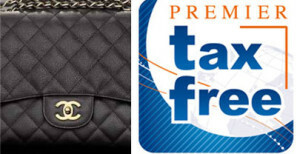 I’m planning to buy a Chanel bag in Italy since the vat rate is higher. My question is what airport should I get a refund? I’m buying the bag in Italy but going home from Paris. So my last EU country will be Paris before going home. Thank you. Your last departure country will be Paris. So get in line at the airport in Paris!! I’m going on Mediterranean cruise in the end of September for my birthday. I was curious if buying a channel, dior or louis vuitton bag is cheaper oversees than USA. I’ve did a little research and seems buying in france is cheaper. I’ll be visiting france (provence), italy, spain, crotia, and greece while on cruise. Which country do you suggest I buy the bag? Also, I saw for Vuitton certain bags aren’t carried in the US and only in france which be cool. Do I email the store and make sure they have bags I want before I arrive? Can I preorder so I know it will be instock when I visit? Definitely France is cheaper. then Spain. I’m not sure about Greece at the moment if they will be cheaper there. When you get to France, you’ll buy a bag (or bags) then you will save the receipts. When you enter Spain and travel you can also buy another bag but always keep the receipt and the custom form that you fill out. Always make sure that you ask the sales assistant to give you the form to fill. When you are ready to leave Spain, take all bags that you buy in France and Spain, with the receipts. Go to the custom booth at the airport in Spain, and hand them all paper works. They will ask to check your purchase. Then you will be asked if you like to receive your money back as cash or back on to your credit card? It does matter what country you’ll fly out, it’s the LAST country in Europe that you are taking off to go home. I’ve never tried to email any store to keep a bag for me. and i don’t think they will do it. You might be able to check out their country website and buy it online? and pick it up at the local store? I have never tried this way either. Hope you have fun in Europe. Thanks for reading! Super helpful post!! Thanks so much for all of this info!! Hi Karen. You’re welcome! I thank you for reading! I would like to correct/update about the Tax refund on Chanel items. You can buy many bags but only 1 passport per bag could be claimed tax. After another 60days you can claim another one. Thank you very much! May I ask what country did you visit, please? I hope someone can answer me, I bought a chanel bag when I went to europe almost 2months ago. And I haven’t receive my VAT REFUND. I’m kinda worried because I wasnt able to have it stamp, I exit out of Bristol England,and they don’t have customs personel there, instead we just drop our envelope and pray will get the money back. My problem is I did not take a picture of the VAT FORM, I don’t know if chanel italy would have a copy of it so i can track it down. I’m supposed to get euro600 back. Pls if anyone knows the answer I would really appreciate it. HI Jenlee. If your last visit is Paris, then you should claim tax at Paris airport. When you said “flying home via London”, if London is just a stop over then you do want to claim VAT refund in Paris. If you spend a day or more in London travelling, then yes, you will be claiming VAT in London. Great Britain is no longer an EU since last year. I don’t think it has anything to do with EU member, you’ll just have the refund in a different currency form.I hope this helps? thank you for reading! Hello thank you so much for all the info. We are planning to explore Europe this coming July. We are flying out of LAX to Heathrow London (buy LV backpack there). Ride train from London to Paris, Amsterdam, Milan, Rome, then fly again to Santorini Greece and fly out from Santorini back to LAX USA. My questions are, is it cheaper to buy an LV in London? and Can I file my VAT refund in Santorini? (Our final destination). Thank you! Hope you can help me as we visiting Europe for the first time. Thank you and God bless! Thank you for reading my post. Before I say Yes to refund VAT in Greece, I would study Greece currency and customs at their aiports before you leave LAX. Greece is no longer in the EU, I’m not sure if VAT refund will still work there. I have been in Santorini airport for a stopover, so I do not know where their customs might be either. Please do your homework before leaving the US. I bought mine from Paris and I file VAT refund in Amsterdam without issues. I’m not so sure if having to buy / VAT refund with different currency will make a difference. If you are going to Paris, why not buy a bag in Paris? I’m not sure how much Heathrow LV would cost but London has lost their currency value, this may be the time to spend money there as well. I would make a phone call for a price check and availability of your backpack. I will keep my options opened in Paris too. Make sure all documents are in one place and filled up before you leave the boutiques. Hope you’ll have a great time in Europe!! Another thing I just asked about Santorini because that’s our last airport before leaving back to the US. I guess my another question is can I claim a refund VAT in any country in Europe? Even we are not leaving yet? Or does it have to be in the airport of our final destination before leaving Europe? Maybe I can refund VAT in Rome before flying our to Santorini, should I? Thank you again for all the reminders and tips. Your post is very helpful! Hi Gina. I would definitely get the Custom stamp in Rome before leaving the EU borders to Santorini. I did not have a good timing in Santorini airport, it was very crowded even though I arrived early for my check-in. One important note, You want to keep your brand new bag inside the box while standing in line at the Customs. They do not want you to use the items before claiming the VAT. All items must be unused. So don’t put your belongings in your backpack and carry the backpack on your back while trying to get the Custom stamps. I would get cash refund if I were you, just to have it done and over with since you’ll have only one item. No need for you to wait 4-6 weeks. All purchased qualified items should be able to get a refund. I only picked one item as an example for price comparison on my blog. The total purchase price is what they are looking for. Have fun in Paris! thanks for reading. Hello, according to the FAQ of the Global Blue website, it lists France as one of the few countries offering the “VAT FREE” program and LV shows up in their list of affiliated stores that are supposed to offer this. (VAT FREE meaning they charge you the “lower” price at the store, already reduced for VAT. You’d still need to get stamped at customs, but assures you the lower price at time of purchase). Has anyone tried asking for this option at Paris LV or is this a complete misprint by Global Blue? Hi I wanted to know if my VAT refund would be more in Spain or Paris ? Hi So, I have not been to Spain, so I cannot really answer the question. But in general, you’d get 10-12% VAT refund and it also depends on whether you want it back in cash or to your credit card? I would think it would make a dent difference unless you spent ten of thousands of dollars. I have a quick question. I am looking at purchasing a bag from Gucci or LV while I am on vacation in Europe. I would make the purchase in Paris, but am travelling home from Croatia. Where would I claim my VAT refund – Paris or Croatia? Hi there, i’m a Student who study in the uk. I’m planning to travel to Paris on my birthday at November. I’ll be graduating at December then fly back to my home country at January. I’m planning to buy some designer bags including Chanel for my birthday as well as helping my friends to get some other designer bags back in home. Do i get VAT refund Paris or UK since it is out of the European Union? Is there a limit for amount of money spend on designer bag? Or one passport can only claim one VAT refund for one bag? You will need to get stamped and get VAT refund at the last country you will visit. There is no limit on how much you will spend but there will be limitation of how many Chanel bags from that same Season you can buy. I don’t know if that is still active. One passport can claim all items/ bags/ shoes. you will have to get them ready at the Customs , do not check them in before Customs. Get to the Customs first , do not Check in first. You will have everything stamped in Paris, if Paris is your last country go to home. You will have to show your passport at stores, so yes, they will want to see identification when you pay. Hi, I’m travelling from my country to Paris then London and then back home. May I know if I should get my VAT refund for my purchases made in Paris at Paris or London airport? I’m not sure if the Brexit has affected anything for VAT refund. Hello, I’m thinking about buying some Louis Vuitton bags on my trip to Paris next month and I know that sometimes the custom agents ask to see the items to make sure they haven’t been used. I know LV bags come in boxes and my question is if we have to keep the LV bags in the boxes they came with or if we can just keep the purses in the yellow LV bags they also come with since if I keep the purses in their boxes it will take up to much luggage space. You don’t have to show them the boxes. In fact, I did not show them my box, i opened the box and handed them the bag. Hope this helps?